It was a day like any day. Me living crazy, on little sleep. I jumped on my Facebook to burn ten minutes until supper would be ready. The red balloon above my inbox was highlighted. Mindlessly clicking on the notifications I scrolled down skimming the notes until one stopped me cold. Just reading the name, hot tears began to tumble onto the keyboard. She was from my childhood. One alpha-girl who had belittled me in grade school. Perhaps it wouldn't have dealt such a blow to my little girl mind, but I lived in a small community where you were either in or you were out of the in-group. To make matters worse I had really wanted to be on the inside of that group. And our moms were friends. It was a disaster that set the paradigm of my mind toward girlfriend relationships. The emotional reaction I had to this unexpected e-mail was nothing less than violent. A deep fountain of pent up pain came forward without warning. I melted into a heap of hideous sobs and tears. Not long into this unwanted episode, I began to ask the Lord, "What in the world is this really about?" What I felt that He spoke into my spirit was that this was a deep root which needed dealt with. And that it had less to do with the person and more to do with my heart. After more soppy tissues I returned to re-read the e-mail. She was kind and upbeat . She spoke as if we had been long time friends, even suggesting we get together for the class reunion. Next came a friend request. To be honest I just stared at the whole thing with, "you've got to be kidding me.." eyes. She really could not know. She must not have any idea what the outcome of those girlhood experiences were for me. And even if she did, she was probably doing the best she could to build a bridge. It's not as if I were even blaming her. However it was with deep emotion, I mourned what had been lost in my childhood, set the course for high school and had long term lingering effects as a woman. It felt ridiculous that I could have such strong feeling lurking in my soul-shadows after so many years. Over the next few days I really inquired of the the Lord about the intense reaction I experienced. This unhealed place was the deep root of sin in my life. It was the foundation of my quest to not 'need' girlfriends and seek the attention of men. Many decisions I made were filtered though this messed up lens. Much of my prodical-ness had it's roots in this place. It was a least part of the reason I never. felt. good. enough. For several days I lamented the pain and cost of the lies I had embraced. There were some really healthy tears. There were some very honest conversations with Jesus. ~ God wants to redeem every single space in my soul. 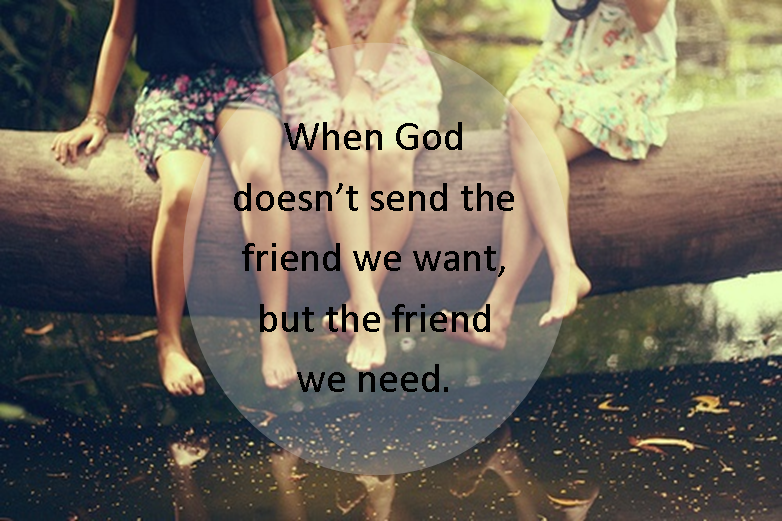 ~ Friendships with other women are important. Then I flat out spoke this: "I don't want to be friends with her Lord." And in my spirit I honestly heard this: "So you are going to choose which women you love and minister to?" Its hard to desire to be with women who have hurt you. Yet I am that woman. Indeed, I have hurt other women in a thousand awful ways too. Some knowingly. Others without knowing. As a little girl I deeply wanted real community with other little girls. And now I'm a woman who deeply needs community with other women. All kinds of women. Every shape and size and background. Young, old and in-between. Because that's how we were designed. My response to reject this woman made me no different than the clique that did the damage in the first place. Being open to whoever the Lord has for me to minister to, drawing beautiful hearts with cords of kindness to the Father, is what I want to spend out my days doing. I actually owe her a thank-you. What the enemy of my soul meant for evil, God intended for good. Just as is His way, God took the broken, messy area of my heart and redeemed it to minister to women with all my heart. He bring them to me. Some for a phone call and some to do life with. As long as He is willing, I am available. I try not to get in the way of who He wants to extend His grace to. 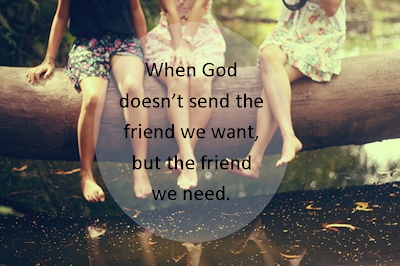 Sometimes He doesn't send a friend I want, but He sends the friend I need. We aren't who we were. And we need each other to become who we were meant to be. 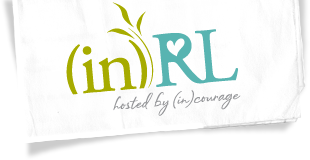 Linking up today with (in)courage.me! My young beautiful friend Amanda and I are hosting our first ever (in)RL event on April 27th. We've made some plans to bless the ladies that will come and are expecting God to show up and amaze us. It is on my heart for women to move beyond their pasts and know how crazy in love Jesus is with them. Also I have been burdened to see more women in my season of life step up and answer the desperate need for multi-generational women friendships. Hoping to see some of that happen on April 27th! Are you interested? There is room for you friend.